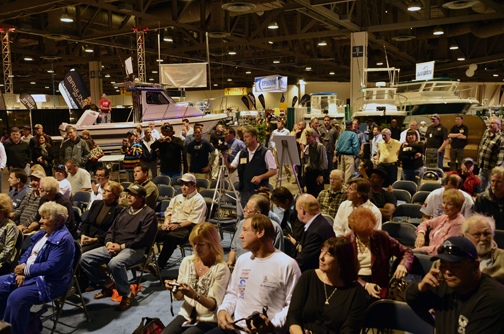 A large crowd of dignitaries and off-the-street spectators came together in front of the Saltwater Stage at the Fred Hall Long Beach Show Thursday afternoon to honor Guy Yocom, from Dana Point, owner of the El Suertudo, and his captain Greg DiStefano, from San Clemente, along with their top-notch crew—Oswaldo “Balin” Ortega, David Poling, Todd Clark, Daniel Alvarez and Jose “Pepe” de la Pena—for Yocom’s remarkable record-breaking 427-pound yellowfin taken south of Cabo San Lucas on September 18, 2012. Pat McDonell, Editor of Western Outdoor News, welcomed the crowd and duly noted that for the second time in two years, a record-breaking yellowfin had been weighed in. The 388-pound, 12-ounce yellowfin caught April 1, 1977 by Curt Wiesenhutter aboard the Royal Polaris, (owned by the late Capt. Bill Poole) had stood for 33 years. Then, on Nov. 30, 2010 it was defeated by Mike Livingston’s 405.2-pound yellowfin tuna caught on Capt. Mike Lackey’s 80-foot sport boat, the Vagabond. Mike was present to congratulate and observe the passing of the torch to Yocom. Presenting Yocom with the official certificates for both the All-Tackle Record of 427 pounds and the 130-pound line class World Record was Rob Kramer, President of the International Game Fish Association, who flew in from Dania Beach, Florida along with Conservation Director, Jason Schratwieser, and Development Director, Eric Combast, and Kelsey Johnson, Development/PR Coordinator. Also in attendance was locally-based trustee Michael Farrior. 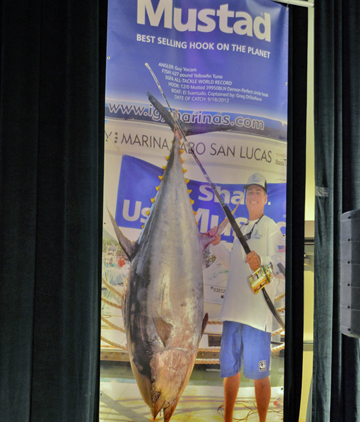 An additional bonus for smashing Livingston’s record is the largest promotional prize in the history of sportfishing: a remarkable $1,000,000 in increments of $20,000 annually for breaking the existing all-tackle record on a Mustad hook during the year-long “Hook a Million” World Record Contest. McDonell thanked Bart and Ginny Hall and their entire show team as well as American Sportfishing Association, partners in the Hall Shows, for providing the ideal venue to recognize and honor Yocom’s catch. After playing a short video of the actual catch, McDonell introduced Rob Kramer and Farrior, along with Yocom, for the official signing and presentation of the World Record Certificates. Kramer said that taking into consideration the 33 years that the record had stood prior to presenting World Record Certificate to Mike Livingston for breaking the Yellowfin record in 2011, he never dreamed that he and his IGFA team would be returning this soon to award another World Record for the same category. 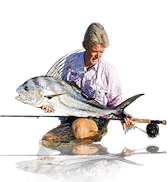 “California is a hotbed of world record activity, with 310 IGFA World Records currently standing, second only to Florida in current world records by states. The top male saltwater and second place male All-Tackle Length anglers in 2012 are Steve Wozniak and IGFA Representative Pete Binaski, who both reside in California, as do 17 Regional Ambassadors of the IGFA, the largest number in any state,” he continued. 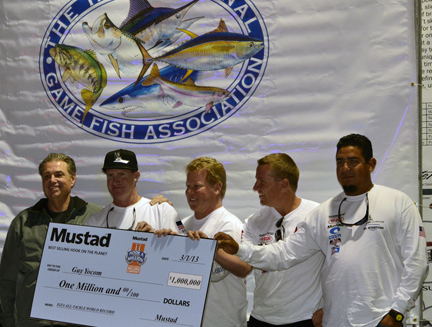 When Jeff Pierce, Mustad US Sales Coordinator, stood to present the ceremonial $1,000,000 check representing the $20,000 annual payout for the next 50 years, he invited Guy and his entire crew to the stage to receive the check. After the obligatory photos, a Q&A for the crew revealed how much preparation Captain Greg DiStefano and mate “Balin” had devoted before the trip. Questions included rigging tackle, verifying IGFA rules and even having all of the line to be used pre-tested by IGFA World Records’ Coordinator Jack Vitek. A reception honoring IGFA and the El Suertudo was hosted by Keesel, Logan & Young in the penthouse of the Union Bank building in Long Beach following the ceremony. 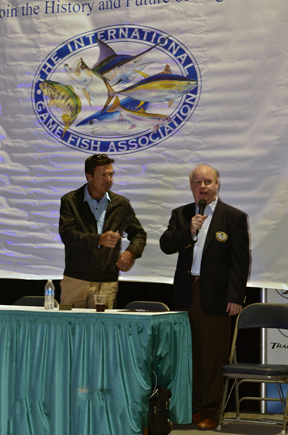 Combast welcomed the IGFA members and friends and acknowledged the three California IGFA Trustees. He noted that Californian Wes Davis was the youngest person ever to achieve a Billfish Royal Slam and also noted that 30-percent of all 10-pound bass club catches were caught in California. Farrior briefly mentioned the IGFA Hall of Fame history and that 10 percent of inductees were from California. He introduced the IGFA Representatives in attendance and then introduced Jason Schratwieser who moderated an in-depth Q&A with Yocom and DiStefano. At the conclusion of the session, Jason reviewed the significance and success of the IGFA Great Marlin Race with a total of 4,227 miles tracked in the first race year, the evolution of IGMR project with the support of Representative Bob Kurz and the value of the billfish data and research provided by the innovative undertaking. Kramer reviewed the Billfish Conservation Act—effectively banning the importation of all billfish into the continental United States. After discovering the problem in South America, then developing an economic impact study and working for six years to raise awareness and push the legislation, it was finally signed into law. An informative promotional video prepared by IGFA’s Kelsey Johnson closed the program. The video can be seen below.